University of Montana students and faculty gave their school’s iconic “M” a fresh coat of glowing white paint Wednesday evening, one of Homecoming Week’s more strenuous celebrations. 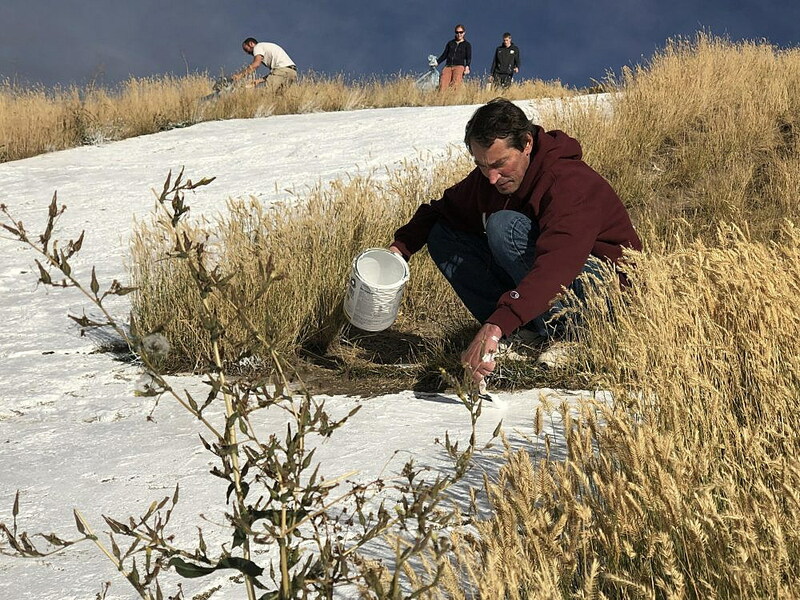 Mount Sentinel’s concrete emblem requires roughly 120 gallons of paint every five or six years, the labor provided by student and faculty volunteers recruited through the Alumni Association and UM’s Office of Civic Engagement. President Seth Bodnar hiked the trail before a meeting, offering volunteers his appreciation for their work. “When you see the University of Montana, everybody sees the M, and this is a key symbol of what makes this university so special,” he said. College of Humanities and Sciences professor Garry Kerr said that this year he wanted to create a new tradition by painting over grizzly bear hairs from two pelts at the Philip L. Wright Zoological Museum. The yearly tradition of placing the pumpkin atop the tallest spire of Main Hall also was his inspiration. “Yesterday when I saw the pumpkin back on Main Hall, I thought, ‘Well, it’s time for another tradition. This has been going on forever, so what about griz hair?’ ” Kerr said. But the M’s rejuvenation will remain a tradition as well – and a necessity. For the 30 volunteers, it’s more than just sweeping and coating the M. It’s about preserving the landmark and being a part of that experience. 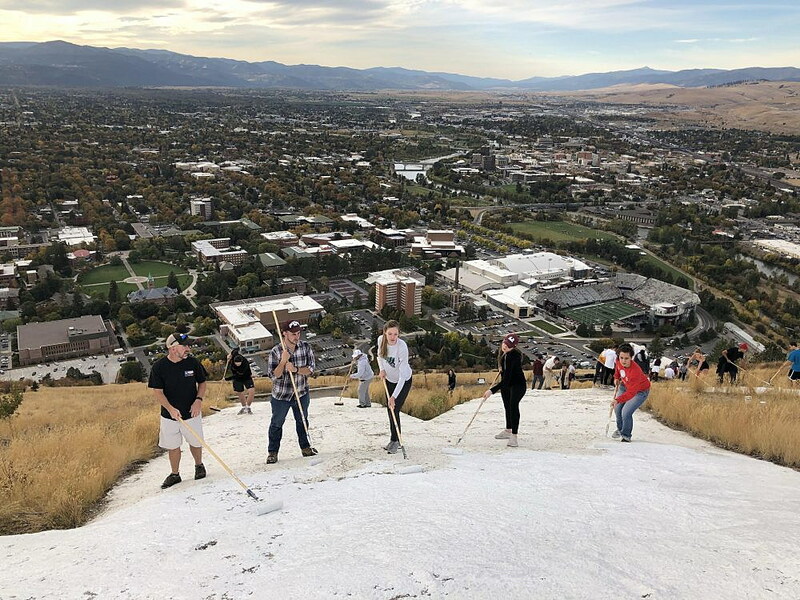 UM freshman Brooklyn Olson volunteered with her friends, and said the M is a major piece of Missoula’s culture and history. “It just represents our community. Not just as Missoula but as the college, and I think when people think of U of M, one of the first things that comes to mind is the iconic M,” Olson said. The M sits at about 620 feet above the city on Mount Sentinel at the top of 11 switchbacks. First created in 1908, the M became a recognizable landmark that was replaced with concrete in 1968. Bill Hemphill has worked for the university as paint foreman for 27 years, having made the trek up the mountain multiple times to paint over graffiti and to add a maroon outline 10 years ago. “It just made it look smaller and you couldn’t tell there was a maroon stripe around it,” Hemphill said. The last time the M was painted was three years ago, when UM basketball coach Travis DeCuire started at the university. As a tradition, the basketball team repaints the M every time a new coach is employed by the university. Having the event take place during Homecoming Week makes it even more special for visitors, Kerr said, who looks forward to creating more traditions in the future. “When alumni come in and people come in for homecoming, they’ll be [at Washington-Grizzly Stadium] looking up here, and they’ll just see this thing glowing white,” Kerr said. This week’s remaining homecoming events include the Yell Night Pep Rally and lighting of the M, on the Oval at 8 p.m. Friday. At 10 a.m. Saturday, there’s the Homecoming parade and the football game against Portland State University at 2 p.m.